Re: Buying Your First Bike on a Budget. I'm looking at purchasing a bike in the near future and I was hoping to get some advice. Assume I know nothing (because I don't). The primary purpose for this bike is going to be fitness, however, I'll be using it to commute to school and work (about 3 miles each way). I'm looking at getting a road bike. One of my concerns was wearing a backpack while riding one to school. This has been assuaged somewhat after reading a couple message board posts and seeing a guy riding down the street today while wearing a backpack. That being said, I still wouldn't mind more opinions on the matter. Another thing that concerns me is bike durability. When I was talking to a guy at the LBS, he was saying that a entry or mid level bike was designed to be ridden about three times a week and last about 10 years. He expressed concern at my plan to use the bike for commuting whenever the weather is nice and using it for exercise. He said that mid level bikes weren't designed for that and wouldn't last as long. Can I still expect 5-6 years with proper maintenance? Since I'll also be using my bike for commuting to school, that involves leaving it outside while I'm in class. Will it be okay being exposed to the elements? Related, is there such a thing as getting insurance against stealing? There are the bikes I'm looking at. I'm ordering online because that's about the only way I can get a bike in my price range. I know there are concerns with sizing, but I'm an average sized male, so I'm willing to take that risk. I've ranked the bikes in order of preference. Is there any compelling reason to choose one over the other? Ok. First find a new LBS. No reason an entry level bike cannot last as long as a high end one. The frame probably longer. Aluminum is more durable than carbon. Leaving a bike out in the elements means you should clean the bike after. A bit of a pain but that's life. Thinking of getting a new road bike, anyone have experience with either of these bikes? Hello! I am new (obviously) and am hoping to get some advice on what bike to buy for both myself and my husband. 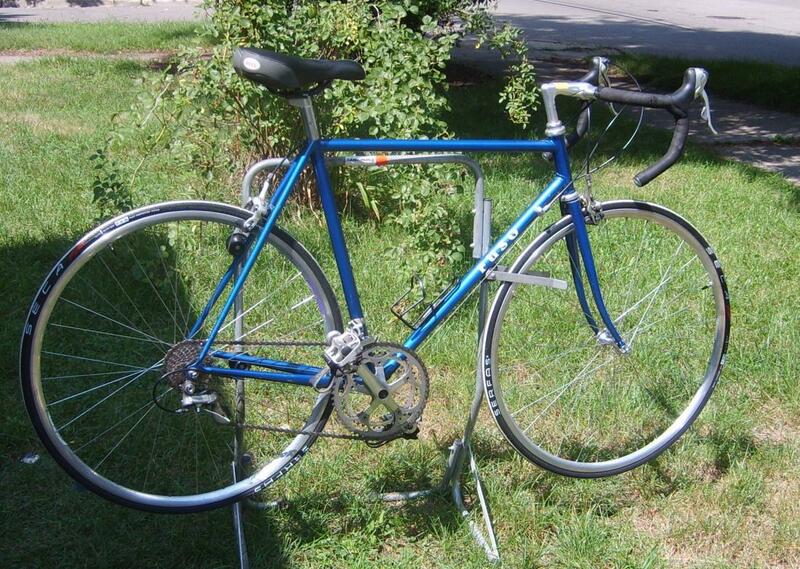 Right now we are looking at getting used bikes on kijiji, so our options are fairly limited. For myself, there is a 2010 giant avail 1 and a 2012 trek 1.1. The giant is 650, and the trek is asking 500. Are these fair prices, and which would be a better choice? Next, my husband has the choice of a trek 1500 (2008 i believe and $600), a trek 1.5 (2012 and $850) and a massi triathlon bike (about a 2010 and asking $500). He will be riding to and from work, which is about 20k a day. We will also be taking weekend rides. Would a triathlon bike be a bad choice? Are these fair prices? Which would be the best choice? Finally, is there any way for me to be sure that they haven't switched out the groupsets on the bikes? For the avail, I am not overly convinced that it's actually the model she is telling me it is. She says its the giant avail 1, which would have the shamano 105 shifters, but I don't think she knows what she is talking about as she was very reluctant to tell me the model number and her ad is very vague. Any suggestions? It's not at all unusual for people to not know what they're selling. Sometimes they don't know the size, and seldom the model year, yet they oftentimes overprice the bike. Best bet is to go to your LBS, get sized/ fitted to a bike and use the geo of the test bike as a basis to shop for a used bike. This will better the odds of getting sizing right. You'll still need an LBS's assistance with dialing in fit, so this is a good way to build a relationship with them. Also, ask about used bikes while there. The advantage to buying used from a LBS is that you'll usually get some sort of warranty and the bike will have been gone over by their mechanics. Buying used, you're on your own, so I suggest before committing to a purchase, ask the seller to take the bike to your LBS to get checked out. There may be nominal charges for this and the fitting, but it gets you some assurance you're getting a solid, correctly sized bike. Lastly, No, a tri bike isn't a good choice for rec riding or commuting. It places the rider more forward and in a more aero position and is a special use bike. Only purchase one if you're actually interested in TT's/ tri's. Thanks so much - that's a great idea. As for the models and prices though, any advice? Used bike prices vary by region and depending on use/ condition, so sight unseen I really can't offer you any reliable advice on that. Best bet is to have your LBS appraise the bike while they're checking fit and mechanical condition. They'll see it and know the pricing in your area. Re: brands/ models, it's a very competitive market, so in each segment they're all fairly equal. Differences will be primarily in the contact points (pedals, saddle, bars/ shifters). That's why test rides are important. Even noobs can tell when something doesn't feel quite right. If you do go with a private seller, continue to press them for information, then check Bikepedia.com or the vendors websites for specs. For used bikes, look for something entitled "Archived" for older models. Which Bikes would you suggest out of these. As a general question shopping for used bikes, assuming both are in equivalently good shape, would you rather have an early 90's bike with 105 components or early 2000's with Tiagra? I'd rather have the one that fit and felt the best, because that trumps pretty much everything else. But if both were relatively equal in that regard, I'd go with the newer bike. Newer Tiagra is as good as (or better than) older 105, and (generally speaking) newer components are less likely to fail/ need replacing. New to road biking and have narrowed it down in my price range to 2 different bikes. Any advice on which one to go with? I'm 6'4" and about 190lbs. This will be used primarily for commuting and the occasional longer ride 20-40 miles. Any advise will needed as this is my first bike and don't know a whole lot about all the technical aspects. Also is there a cheaper place to buy one of these bikes? Some questions to think about for a newbie buying new. 1. Do I know exactly what size fits me? Seat Tube, Top Tube, Stem Height, etc. Different brands will have different geometries. Unless you know some of these things to withing a mm or two, you'll want to road test a bike with that exact frame to be sure that it will fit. If the bike doesn't fit, you'll either have to send it back for another bike (and shipping it back will cost you money), or you won't ride it. 2. How willing and knowledgeable are you on putting a bike together and doing bike maintenance? If you need a LBS to put the bike together for you, then that could be another $100 right there. And if you need adjustments from the LBS, they'll charge you for that. If you buy from the LBS, putting the bike together and adjustments are going to be free. Unless you're absolutely sure on these things. Now, if you're coming from mountain biking, you may be more knowledgeable on these item than where I was a month ago. To me, it was worth the $100-$200 to buy from a LBS (Performance Bikes). I would recommend Performance Bikes to you, but it looks like the closest one to you is in Ann Arbor, so it really isn't a LBS. Both bikes are 8-speed in the rear, which probably means mostly Claris (or older Sora). You should be able to find something comparable at a LBS for ~ $600. BD will often have the least expensive bikes, buy you may end up paying more for putting it together and maintenance, if you're not planning on doing that yourself. At least go to some LBS's in your area, see what they have and road test some bikes. That will at least give you a baseline on what kind of geometry you want on the bike. Thanks for the input. My dad is a big biker and said he would help me put it together. I was planning on going to a shop to get sized regardless of whether I buy online or in store. Was just wondering if either of these stand out as being a better buy for the money. 1. Motobecane has better shifters: Shimano CLARIS ST-2400 STI 8 Speed Shifter, which look better than the Mercier's Shimano STI ST2303. The big difference it looks like is that the ST2303 has thumb shifters for down shifting, where the ST-2400 has a second lever for shifting. With the thumb shifters, it's very hard to use that shifter from the drops. 2. Mercier had a triple front crank as opposed to the Motobecane's double crank. That might help for commuting. 3. Mercier has rear rack mounts which might be helpful for commuting. If you're going to primarily be commuting, the Mercier might be a little better. If you could get the Mercier with the ST-2400 STI shifters, then that would be the best combination. There's not a big difference between the two. You have to decide which of these 3 are most important to you. Hi all! I am looking into buying my first road bike, so I went down to my LBS and asked the guys there what I should get. We looked at a few (I stress few because my budget is only around $600). I want to get into road biking for exercise, but not racing. I probably won't buy clip-less pedals and some of the other more "intense" things until later. I was thinking a bike, helmet, good pair of sneakers, saddle bag w/ repair kit, and water bottle holder would be sufficient for now... thoughts? One was the SE Royale 16. It was an aluminum bike, but they had replace the front fork with a carbon one. I haven't been able to find many review on this bike or brand, except for ones that complain that it did not come pre-assembled when ordering it from amazon. Does anyone know anything about this brand or model? This bike was also significantly cheaper, so if there is reason enough to try it out, that'd be great! The others were Treks. The Lexa and the 1.1. They all looked pretty similar to me, so is there a significant difference between a Trek vs a SE, or these models? Is there something different altogether that I should consider? Thank you for any time/advice!! We don't know where you live, so we can't really suggest anything too specific. If you live near a Performance Bike, then you should probably check them out, as they tend to have bikes in your price range. I'd check out other LBS's in your area, and test ride bikes in your price range. Sometimes you might have to test ride a bike that is a little out of your price range, but the LBS can order one with the same frame, but a groupset that is not as good. In your price range, if you get a bike with Shimano, you'll probably be looking at the Shimano Claris groupset (maybe the Sora groupset on a previous year's model). The Shimano Tourney is considered to be pretty inferior to the Claris groupset, so you should probably avoid them. The SE Royale 16 looks like it has Claris, so it would be a decent bike in your price range. Remember that fit is very important, and if the bike doesn't fit, then it's not a good deal. I also recommend going to several LBS's because that lets you try different brands, and each brand has a slightly different geometry, and one brand's geometry may fit you better than another brand's geometry. Also, by going to several different LBS's, it helps you compare one bike's fit to another bike's fit. And some LBS's may try to put you on a bike that doesn't quite fit, because they want to move the bike. By trying several LBS's, you should be able to figure out if the bike doesn't quite fit, by comparing it to a variety of other bikes. Definitely get a bike that fits, you dont want to invest in something that will cause you aches and pains. Bear in mind that there are several road geometries (race, Endurance, cyclocross, TT) and they all fit slightly different. For instance im a 58cm on an enduro geometry, but on a race frame im more comfortable on a 56. Also, dont let Claris discourage you. I rode a '15 Specialized Allez with Claris 2400, and despite being an entry level gruppo I thoroughly enjoyed it. 8 speed has been perfected so theres much less tinkering and adjusting youll have to do. I wouldnt go with A050 (Tourney) though, thats a little too low end. - down tube or bar end shifters. if it has all that stuff, i consider it at least mid-level ... so it's worth fully refubishing and riding it. I bought my bike at goodwill. I spent more getting a match set of wheels. Beautiful... congrats and ride safe. Thanks everyone,I found out many intresting things! The Nashbar aluminum 105 road bike is going to be $630.00 on the 17th. It comes with a lifetime warranty. Unlike other warranties out there this one will give you a full refund for the rest of your life. That's the Nashbar promise. . If the 17th is to soon then just buy it on any of the 25% off sales for $675.00.